As recently as 1990, American symphony orchestras accounted for an average of 60 percent of their budgets in earned income. This meant, at the time, that if you weren’t selling enough tickets (and other services) to make 60 percent, then you weren’t considered healthy. 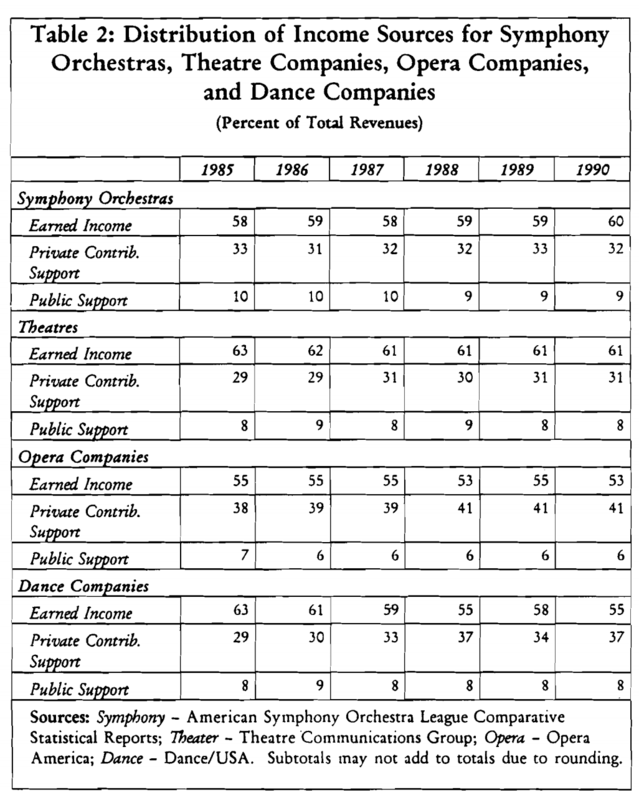 A report in 1991 – The Financial Condition of Symphony Orchestras – conducted by The Wolf Organization, said that attendance at orchestra concerts between 1970 and 1990 had increased 53% (from 17.5 million to 27 million) and the number of concerts had increased by 39% (to 18,000 from 13,000 concerts). A few months ago The League of American Orchestras reported that in 2014 orchestras produced 28,000 concerts in front of an audience of 25 million. So a 55 percent increase in number of concerts over 24 years but a slight decline in total audience of about 7.4 percent. The biggest change in the numbers was in the percentage of earned income – from 60 percent in 1990 to 40 percent in 2014 – a decline of a third. So now if you aren’t making 40 percent of your budget at the box office, you’re not succeeding at the model. Many financial approaches have been tried over the past 50 years to improve the financial condition of orchestras. Yet, the industry as a whole appears to be in the worst financial shape it has ever been in by several objective measures. Unless changes are made in the way orchestras do business – changes that are substantial and systemic – the future health of the orchestra industry is in serious jeopardy. But that’s a conclusion from the 1991 Wolf report, not the 2016 League report. There are many observations to be made about the drumbeat of woe accompanying discussions about the state of orchestras’ financial health and how that shapes debate about what’s going on. And that’s not even to mention a perhaps even more important discussion that might be had about a comparison of orchestra artistic quality over decades. So the headline over the New York Times story about the report – It’s Official: Many Orchestras Are Charities – focused on the idea that American orchestras are now more dependant on philanthropy than selling tickets. And that sounds dire. Could one not make the case that so few people want to buy tickets to hear orchestras that they have to be subsidized for their unpopularity and maybe should just be allowed to fade away? But let’s make a comparison. A report this month issued by the Association of Art Museum Directors says that American museums depend on ticket sales for only 6 percent of their budgets. That’s a fraction of the earned income that American orchestras achieve. And yet the debate in the museum world isn’t about museums as a failing model but whether or not they should just abandon paid admissions altogether (as they did in the UK). Charging no admission would change the way people used museums, it might change the types of people who use museums, and it would certainly make museums more accessible to a broader range of people. Certainly there are museums that are in financial distress. But discussions of the museum “model” seem substantively different that those about the orchestra model. They’re more about what kind of audiences you want to serve rather than how many tickets you need to sell. Maybe that’s because concerts are time-based and have a finite, expirable inventory. But I suspect it’s more because concerts are considered events to be sold while museums are more like public libraries – resources to be used. Orchestras sell tickets. Museums sell memberships. But what’s so special about earning 60 percent of your budget or 40 percent or six? These are imaginary lines in the sand. If orchestras were a real business and charged what expenses cost plus a profit markup, only very rich people could afford to go. If orchestras only made 6 percent of their budgets on ticket sales you’d likely find a very different audience would be there and that audience would think about concerts in a different way. People go to movies and don’t get too upset if the movie is bad because it doesn’t cost much. But pay $100 for your orchestra ticket and the bar for satisfaction gets a lot higher. Maybe it’s shallow, but ticket price colors the experience. Orchestras like the St. Paul Chamber Orchestra reduced prices and started selling memberships (like museums do) and found a dramatic increase in attendance and community support. Membership organizations are pervasive throughout our culture. Bike clubs, birding clubs, associations to support everything imaginable. Journalism is increasingly adopting the subscription model, which unlike the orchestra subscription model, is actually a membership fee that buys access rather than charging by the article. Maybe it’s time to start asking people to invest in the art, in the idea, rather than buying the transaction. There is no model for bringing the dead back to life. Symphony orchestras could hardly be more anachronistic. Our efforts should not be directed toward futile attempts to revive them, but toward palliative care to give them a dignified death. The massive funds that orchestras hog are an absurdity. We’re like a family that spends so much time and money keeping a decrepit, 104-year-old grandpa alive that we let our children literally starve to death in their cradles. It’s time to get real. Orchestras haven’t added a significant body of literature to their repertoire in over 80 years. They were established in the 1840s in Leipzig and Vienna as a medium for the new forms of romantic cultural nationalism that were evolving, an ethos that was banished in disgrace after WWII. We have passed through two or more major cultural epochs since the founding of symphony orchestras, and yet the focus of their repertoire has not changed. It remains locked somewhere around 1870. To be sure, orchestras brought us some of the most glorious art humans have ever created, but the ideals that formulate their artistic ethos such as cultural nationalism, industrialization, the transcendentalism of radical will, patriarchy, large scale regimentation, authoritarianism, and hierarchical power created a European cultural climate that helped lead to WWII, the largest cataclysm in human history. It is cowardly to remain oblivious to this history. Our efforts to update orchestras with a kind of corporate, modern-day capitalist sheen have failed. We see so many values that are antithetic to art: administrators and musicians sucking up to rich people; the creation of closed cultural country clubs for the wealthy; endless administration/union disputes; artists living in bored routine like factory workers; art reduced to codified performance practices that have fallen to suffocating orthodoxy; and vanishing, geriatric audiences. Orchestras are now associated with the most bourgeois, dull, conformist, materialistic artists and administrators in the arts world. All too often, one might as well try to discuss contemporary artistic thought with a bunch of accountants and gym teachers. So the real question is how to move past our the neocrophiliac obsession with orchestras and move to the future. What sort of palliative care for orchestras would be best as they fade from history? How do we create and promote classical music mediums that correspond to our own, contemporary world? How do we shift our focus to our artistic children and move toward a newly evolving world that in spite of all our troubles is still full of promise and hope? William: Wow, that’s quite a screed. So there are essentially three directions here: 1. keep trying to prop up the old model and hope for the best. 2. write the whole thing off and start over with something new because there’s nothing worth saving. Or 3. try to build on what there is and evolve something new out of it. Just to break it down further: there’s the artistic fact of what orchestras are/were/might be, and then there’s the social model that supports the enterprise. The models that support pretty much every enterprise these days are broken. And with AI and mechanization just around the corner, anything that hasn’t already been upended will certainly be so. The idea of “jobs” at the center of our social structure will have to change because there will be many fewer of them. So pretty much the economics for everything around you will have to adapt. While I’m concerned about the models we try to use to support art, I think that this interim adaptive period is simply one we have to navigate through and survive. So I wouldn’t lightly write off something right now merely because its model isn’t working. Nothing really is. If you’re talking about orchestras as an artistic construct that has anachronistically survived its usefulness and should be written off to another age (which you seem to be saying), I think all art evolves and surges and wanes over time. Perhaps orchestras clung so fiercely to the past in the 20th Century because the present was scary. Perhaps the new kind of scary we’re in in the 21st Century will renew them. We see a turn away from processed foods towards the artisanal. Away from e-readers and book warehouses to print and small shops. As the world is increasingly defined in digital terms, there seems to be a renewed yearning for the physical, analog, sweaty product of actual humans. Different ages have different values, different needs. I’m merely trying to argue that if we only see institutions such as orchestras in the models they have been in, then we may not see a different way in which they might evolve. I’m not arguing for or against subscriptions or low ticket prices or higher subsidy. I’m just saying that there might be other models of community support that might be worth considering. Orchestras are clearly losing the evolutionary game. They can’t seem to mutate. From a wide perspective, we formulate a narrative of art history as one of morphing and evolution, of continuities that slowly transform. The problem with this narrative is that it overlooks that cultural history is also full of dead ends, of hurdy-gurdies, antimacassers, and ophicleides. As often as things morphed into something new, things died to make way for forms that had no past. The symphony orchestra is in that category of evolutionary extinctions. It will be a sort of childless but distinguished old man remembered for his great accomplishments, especially if we don’t look too closely at what lied beneath the surface. So I wonder about endless attempts to revive orchestras. We can view an ophicleide from a hundred angles, but an ophicliede is an ophicleide, an orchestra an orchestra. 26,000 concerts for 25,000,000 people per year is not a situation where you are trying to bring the “dead back to life”. To have any meaning, we need the source for your numbers, along with the context: the demographic that was measured (a country?, the world?,) the status of the orchestras (student, semi-pro, professional,) the sorts of programs presented, etc. And then the data would need to be compared to other forms of cultural engagement, such as the average American watching TV 5 hours per day, or that 25 million might be close to the number of people who go to the movies each day in the world amounting to billions per year, Advocates get pretty free with their numbers. Also, the stagnant repertoire would need to be addressed if we are to claim orchestras are alive. If one subtracts pop concerts and special events, the percentage is probably around 5% or less. (And even less is one considers that the number is more likely based on tickets sold, not the number of individuals that attended.) By any measure, this is only about an 8th or 9th of the percentage that attended in the 1930s. And correspondingly, the average age of attendees has risen sharply. In 1937 the median age of a person attending an orchestra concert in Los Angeles was 28. Today the average age is about 25 years older. I think we will see that this century long nose dive will curve into a low plateau of about 3 or 4 % of the population as orchestras shift to a museum function and become a type of early music ensemble maintained by large subsidies. In this sense, instead of saying orchestras are dead, we could think of them as large, glorious, 19th century vegetables on very expensive life support. All of this will be denied, of course. One of the hallmarks of dying institutions is delusion, the feeling that some miracle will happen and that the Titanic will float again. This should be taken into consideration when planning the palliative care of orchestras. I think it’s a great idea! Many more people would attend orchestra concerts if the price weren’t so high, and would go more often. Membership and low concert fee’s might even bring in more revenue then the single ticket sale. Barbara: I’m not explicitly advocating to reduce the price of tickets, though that would clearly help. I’m trying to suggest instead, that in many other community pursuits, there is a different attitude about supporting that community. Discussions about museum viability seem very different to me from the way we talk about orchestras. Obviously there are big differences but the emphasis on how to serve an audience seems different. Similar to museums, why not have a range of musical events occurring on the same day or even the same evening under the umbrella of symphony orchestra organizations, perhaps even amending or adding to their official name reflective of this multiplicity. Such a concept would be inclusive of the history of Western classical music, but also include traditional music of those cultures that have influenced Western composers. In addition to orchestra performances, there would be various forms of chamber music, including solo performers such as pianists representing Western forms and tabla players representing the Indian classical music tradition. And mindful of the present, there would also be music made with technology such as I do myself. This would break down barriers of what to expect and who one might run into, also dissolving uselessly artificial hierarchies of musical thought and practice. In other words, just like a museum, where one often goes to experience a range of artistic endeavor, the same would hold true for music. Perhaps most importantly, visitors would often find themselves experiencing music they would not normally expose themselves to, broadening perspectives and inspiring new thoughts. I love thInking about the museum model, Doug. Great points. Your comment that orchestras have time-based and finite, expirable inventory made me envision an audio museum where people could move from room to room, listening for as long as they like the content orchestras have recorded at their subscription concerts (and chamber music one-offs) and make available for windows of time so the “exhibits” are always changing. There could be a permanent collection of audience favorites. Offer sippy cups, make the rooms really comfortable environments and the admission price really low. With museum-style hours, people can wander in wherever they have time and stay for as long as they like. Let’s expand the availability of what orchestras and ensembles are already doing and use technology to make it more available – and fun to share and learn and enjoy great music together. I love the idea that, like a movie theater, I could go to the orchestra hall on days when it’s “open” and select an experience among dozens offered on open days. I imagine a marquis that includes a classical string quartet at 1, a Chinese music symposium at 2, a solo violinist at 3, an interactive light show at 4 and an instrument petting zoo open all day long. Of course halls would need to be re-designed to offer such multiple venues. But the model of buying a ticket for a certain night and sitting passively is at odds with nearly all cultural trends about how people plan and spend their time. I like this idea. Offer an immersive environment in which VR puts the orchestra and sound all around the visitor. Could trigger whole new audiences and spread the wealth to the existing ones who fine the cost prohibitive.